A Parade of Pretty….. Dressing the Bride and Your Maids | Fashionitsa by Nitsa's!Fashionitsa by Nitsa's! What a fun time to look forward to! You may already have visions swimming in your head of how you and the rest of your wedding party will be dressed, imagining colors, styles, and fabric… or you may be the bride who never thought about those details. Whatever the case, use this time spent before your wedding day, with family and friends, to create life long memories. Be aware that everyone has their own sense of style and preferences, but this is your time to express your story. Having the support from family and friends is wonderful, but realize that you cannot please everyone during this journey and the more people you involve, the more opinions you will receive. Stay true to who you are and confident once you do make a decision, so that you can proceed with a clear mind with all of the other choices that lay ahead. So Let’s Begin with your Gown….. Typically, when a bride looks for her wedding dress and accessories, she has an idea of the wedding date, venue, and budget. It is not unusual for a bride to begin the wedding dress shopping timeline fourteen months to ten months before the wedding day. 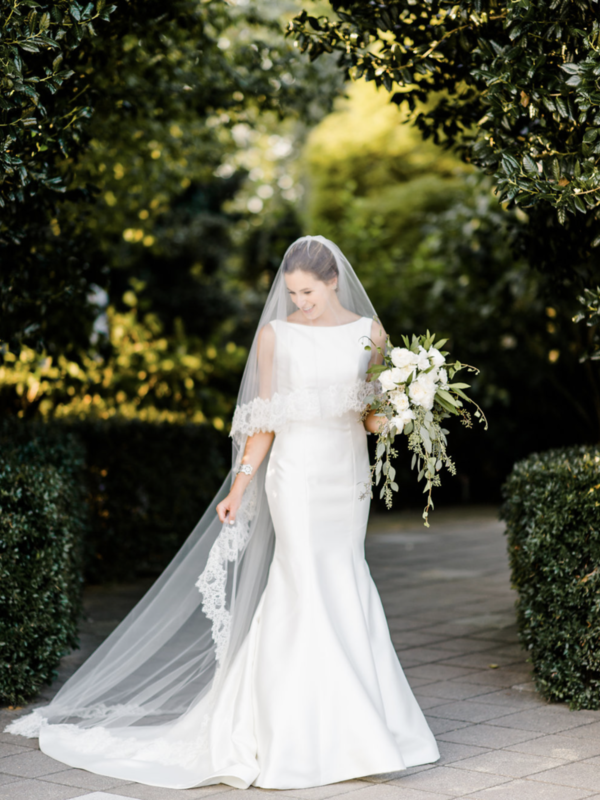 Having time on your side will allow the many months it takes for a dress to be made, the process of the two to four dress fittings, and the time to schedule a portrait before the wedding so that it can be displayed at the reception site, if desired. This is not to say that you have to start the search this early, but it does afford you with more options. We have taken care of many brides who have had wedding dates as close as five months to two days prior to the wedding. Many designers will offer an expedited shipping date for the gown to be made sooner, and they will charge a rush fee for that service. A bride can also buy a dress off the rack and have it fitted to her body during the alterations process. For the bridal salons that offer in house alterations this is a win-win for the bride to insure that her dress will be ready in a timely manner and her journey will be stress free for the fast approaching day. Whether your gown is ordered or purchased off the rack, bridal alterations are typically needed. It is so important to have quality alterations performed on your dress. That great fit will add beauty to you and your dress. If a seamstress is not offered through the bridal shop that you purchase your gown from, word-of-mouth recommendations will be helpful to find someone you trust. The importance of a professional seamstress is their knowledge of fabrics and styles, along with the different techniques used which may involve specific hand and machine sewing and pressing methods. While the venue options for today’s bride are endless, that choice may influence the style and fabric choice of the wedding gown. You may be thinking of a formal religious ceremony and country club reception in your hometown, an outdoor rustic or garden theme at a local barn or vineyard, a mountain top retreat, or a tropical island destination with a smaller guest list. Several of the silhouettes to choose from include the ball gown, A-line, mermaid, trumpet, and sheath. The fabric options are even more plentiful; beautiful laces, fluffy tulles, flowy organza and chiffons, sleek satins, structured Mikado, crispy shantung or taffetas, and draping crepes or a combination of the aforementioned that can also be embellished with beading, crystals and or embroidery. Don’t be surprised if you see ostrich feathers attached to bridal gowns on the runway at this spring’s Bridal Fashion Week in New York and Barcelona! The creativity of the designers continues to amaze me. As you begin to try on dresses, keep an open mind. There may be certain styles that flatter your figure more so than others. I will list a few body shapes and compatible dress silhouettes. For example, a pear shaped figure indicates that you have a smaller upper body and a fuller lower body, proportionally speaking. If you choose an A-line or ball gown skirt that flares out from the waist, it will be more forgiving on your lower half and this will give you a beautiful balance with the overall dress. If your body is straight, where you do not have as much waist definition (athletic build), look for a dress that cinches at your natural waist and perhaps accent it with a plain or beaded sash. Even certain architectural lines in a dress fashioned by the designer, will create a beautiful and flattering illusion on your body. 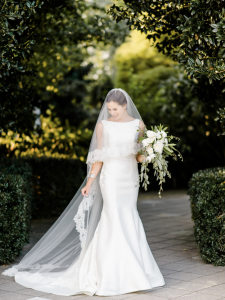 For those brides with a fuller upper body, also known as the apple shape, you can elongate the torso by using a neckline with a deep V shape which draws the eyes up and down instead of horizontally. Also, princess lines on the dress, which are vertical, will accomplish this look. Whatever your body shape, there is a plethora of bridal designs from which you can choose, but keep in mind that the wedding industry sizes dresses differently. It is important to know that wedding dress sizing tends to run two to three sizes larger than the dress hanging in your closet. But no need to let that get you down; it is all about the fit and not the number on your dress tag. What you may envision yourself wearing is not what you may end up buying. During your shopping experience, when you are surrounded by beautiful dresses and a knowledgeable bridal stylist, it could be the first dress or the last dress. Trying on is the key. You will be amazed at the difference of seeing the dress on the hanger compared to seeing it on your body. Once you have the dress on, so many factors play a part in the dress transforming you and you transforming the dress. The synergy that is created between the bride and her dress is unique to every bride. You see yourself in the mirror and you feel it from your heart. It could be the beautiful fabric or the unique details, the way it makes your face glow, or the way it shows off your figure. The dress that makes you feel the most beautiful will be the dress that becomes “The One”. The Time to Buy Accessories…..
Once you have checked off your wedding gown purchase, there is a sense of elation and relief. So, what is next? Accessories of course! Many bridal stylists will show you veil options that help you complete your bridal vision as you narrow down your bridal gown choices. Seeing yourself in a veil somehow transports you to that magical moment of your wedding day. Veils can be made in various lengths and with lace or ribbon edgings to name a few. Veils can also be made with a blusher, which is a tulle layer that can go over your face during the ceremonial walk, if desired. Many times, the veil is decided during the purchase of the wedding gown and can take up to two to three months to order. Other accessories may include a headpiece which can be worn with the veil and kept in the hair during the reception, jewelry, and shoes which are necessary for the first fitting with the bridal gown. When trying on shoes, consider comfort as well as beauty. You will be a much happier bride at the end of the evening. I like to think of accessories as the bow on the package! Choosing your Besties and their Dresses….. 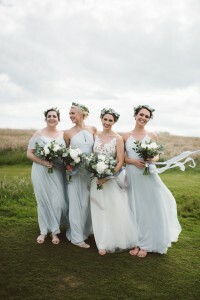 I have occasionally heard a bride say that deciding on the bridesmaids’ dresses was harder than finding her bridal gown. I always say they are your bookends; they are there to offer their support and complete your wedding vision. Your choices for them will include color, fabrication of the dresses, length of the dresses, and neckline styles. Consider the body shapes of your girls, and let them know that bridesmaid dresses require larger sizing as compared to their regular dress sizing because the patterns are cut smaller. Sorry, but this is indicative of most sizing in the bridal industry. Keep in mind that an A-line silhouette will be forgiving for the many shapes that may make up the wedding party. A full service bridal salon may also offer several bridesmaids’ lines and the stylists will guide you through this process. Once the girls are sized (this could take around one month, depending on where they live), the dresses may take several months to make. We usually begin the bridesmaid process five months before the wedding. This gives plenty of time for sizing, ordering, and sending the dresses to the girls for alterations. The special order for all of the maids is typically placed at one time for the entire wedding party so the fabric is cut from the same bolt and dye lot. There are beautiful color options available from the designers and some brides mix several colors and styles for their wedding day look. You can choose from many fabrics including ethereal flowy chiffons, dazzling sequins, or structured crepes to name a few. With many of these fabrics there are lots of style options and many brides now give their bridesmaids several choices including V neck, halter cut, bateau neck, and one shoulder styles. 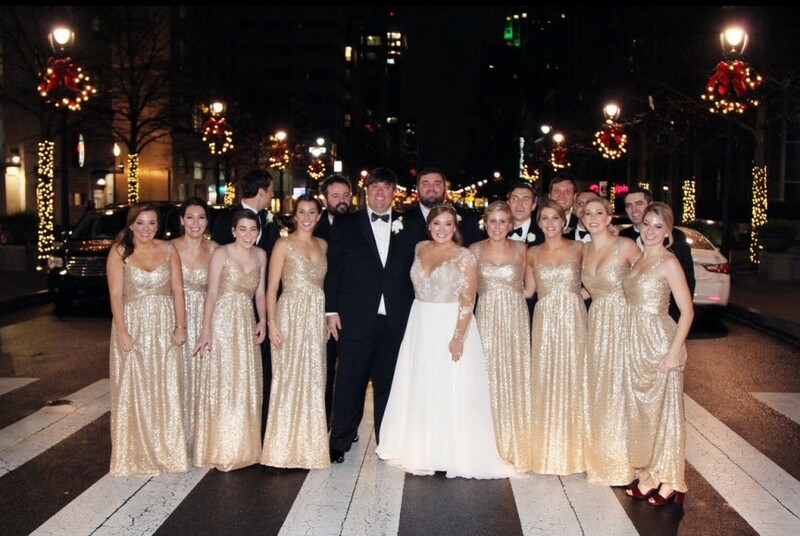 Once you have checked this off your list, your bridal vision will seem more complete…a parade of pretty! Nitsa’s offers the finest selection of couture bridal gowns, bridesmaid dresses, veils, accessories, social occasion and cocktail dresses, sportswear, and cosmetics. As the Carolinas’ Couture Bridal Salon, Nitsa’s provides its signature personal service and exceptional in-house alterations. Fabulous since 1964! This entry was posted in Bridal by fashionitsa. Bookmark the permalink.